OmiCronFX : Taking investment chips off the table | Is Mark Carney, BoE governor, the boy who cried wolf? 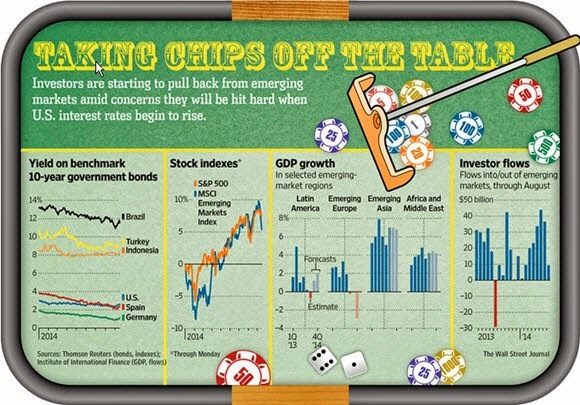 Taking investment chips off the table | Is Mark Carney, BoE governor, the boy who cried wolf? We like the graphic above, which we have obtained courtesy of our friends at the Wall Street Journal. While it appears to be a little busy, it does show the key elements in the nascent recovery that is under way in global economic terms. Yield is the holy grail of the big players, the institutions and hedge funds that go to make up international investing, whether that is in bonds or in terms of the Carry Trade, which follows interest rate differentials in different countries in order to turn a profit. Of course, bond yield and rate differentials are closely linked. The stock indexes, while not part of the “real economy” according to some economists with influence in the US Federal Reserve, do serve as a useful barometer of interest rates, as the current bull market in equities has been fuelled, to a large extent, by cheap money. For every nation, big and small, GDP and GDP growth are indications of its wealth. This impacts, most of the time, on the daily lives of citizens as well as on investors. For recovery to take place, these measures must be good and are, therefore, closely watched. The last part of the pictures shows investor flows. When interest rates plunged in Japan, then in the US, and more recently in the Euro Zone, international funds took themselves off to developing nations in their search for yield. Now this is in the process of being reversed, to the detriment of those emerging economies. We got a foretaste of that last year (big red negative bar on the “Investor flows” chart) when monetary crises were triggered in such as the Rand, the Rupee and others as a result of this, on the occasion of the former Fed chief, Mr. Bernanke, indicating that Quantitative Easing (QE) in the U.S. was about to be tapered. Is Mark Carney, BoE governor, the boy who cried wolf? Yesterday, in a speech to actuaries, those number crunchers so beloved of the insurance industry, the Bank of England governor, Mark Carney, indicated, once more, that interest rate rises in the UK are coming. He was not able to be specific about the timing, but did say they would be gradual and carefully measured. Normally so focussed on pronouncements such as this from Central Bankers, yesterday the Forex market just yawned on receipt of the news. The problem seems to be that Mr. Carney has said just such as this before and caused serious flutters in the hearts of pound Sterling traders, only to have things fall back again in short order. Next week sees the end of the current month and quarter and the start of new ones. We might see something in the nature of a rise in Sterling then.